Taking care of my skin has become a huge part of my life, and no skincare routine can be fully effective if you don't start with well cleansed skin. The Soniclear Petite comes with a brush head (which has a cover), a USB charger, and a storage/charging stand. The Soniclear is unique to other sonic cleansing brushes because it has specially treated brush heads that are clinically proven to reduce 99.9% of bacteria after 24 hours. This antibacterial treatment also allows you to continue using the same brush head for up to 6 months, vs the 3 months of other brands' brush heads. The brush is waterproof with 3-speed settings for a customizable experience. When on, the brush has an automatic timer which tells you when to move to a new area of your face to prevent over-cleansing. The sonic-powered motion works with your skins' natural elasticity to cleanse and exfoliate gently, but also 6x better than just cleansing with your hands alone. The Soniclear Petite also has a 5-year warranty. There is a short video below with information and a demo. Please excuse me being sick while filming, hopefully it's still clear. 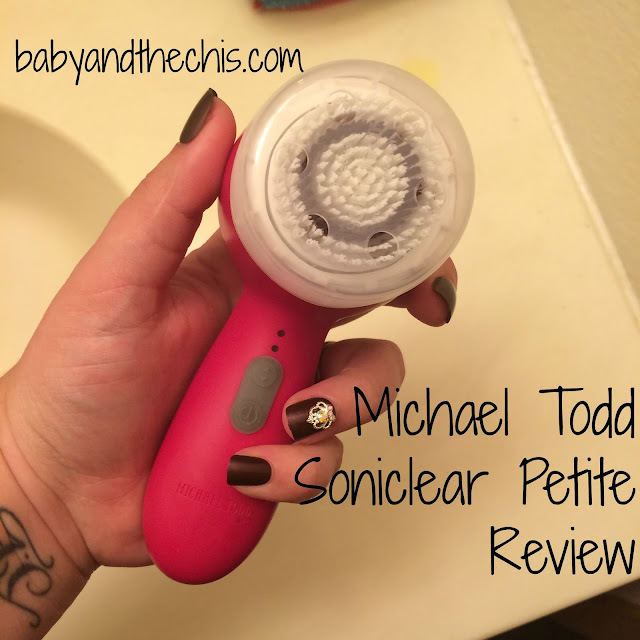 I am very happy with the Michael Todd Soniclear Petite. You can find them at Ulta.